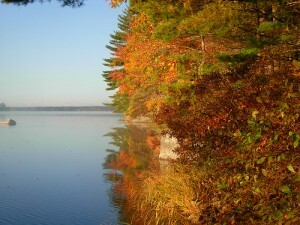 Fall colours over a Keji lake. Nova Scotia boasts two national parks, Kejimkujik in the center of the province and the Cape Breton Highlands on the world-famous Cabot Trail. Of the two, the Cape Breton Highlands National Park undoubtedly boasts the most spectacular scenery. Imagine soaring cliffs with the ocean crashing below and unlimited opportunities to spot wildlife like bald eagles, moose and whales. Its beauty is easily accessible too. You can appreciate the park as you drive the Cabot Trail or from one of the many hiking trails that run directly off the main road. Kejimkujik, or Keji as it’s commonly called, is less of a stunner on the surface but with a few days to spare, you’ll be won over by the tranquility you can find here. Even at the height of summer, you can take your kayak out on the lakes for a trip into the backcountry and quickly paddle away from civilization. At night, the haunting call of the loons lulls all the campers to sleep. Both parks are fabulous places to see Nova Scotia’s autumn colours at their best. Just remember to book ahead in high season if you’re planning to camp at either park. Places at the campgrounds fill up on weekends in July and August.